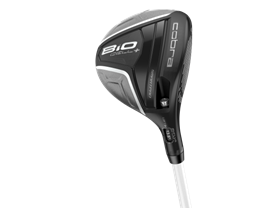 CARLSBAD, Calif. (Jan. 16, 2013) – Today, COBRA Golf announced the release of its BiO CELL+ Fairways, featuring a tour-inspired compact head design with eight tour-loft/trajectory settings to deliver fine-tuned distance with workability and control. MyFly8™ Technology with SmartPad™ – Golfers can choose from eight simple adjustable loft/trajectory settings to maximize distance, manage trajectory and optimize yardage gaps on any course and any conditions. SmartPad delivers a square face at address with any loft/trajectory setting. High Strength Face Insert and E9™ Face Technology – The thin forged high strength steel face inserts on the BiO CELL+ Fairways offer Driver-like construction, enabling greater face flex for faster ball speeds and improved distance. The E9 Face delivers a square face at address with any loft setting. Tour-Proven Head Design with a Low Forward CG– A compact, pear-shaped head design—the result of collaborating with COBRA Golf Tour players—delivers a lower center of gravity for greater distance and trajectory control. Custom shaft options – The BiO CELL+ Fairway features a Matrix Red-Tie 6Q3 shaft and golfers have the option to order a custom shaft with no upcharge. The custom shaft options are: Diamana D+ White Board 72 shaft and Project x PXv Tour 53gram shaft. The BiO CELL+ Fairways are available in right-handed 3-4F and 5-7F models and feature a Lamkin – ACE 3GEN 360 grip. They are expected to have a presence in the bags of COBRA PUMA GOLF Tour players including Rickie Fowler, Ian Poulter, Lexi Thompson and Jesper Parnevik throughout the 2014 season.